Another great tradition has fallen by the wayside - as opposed to rolled down the hillside. They've cancelled the great Gloucestershire cheese race. Yeah, that's right. Too bad. For the last 200 years, apparently, people have gathered on a hillside in Gloucestershire, England to chase a round brick of cheese, as thousands looked on. And that's why they've cancelled it. Just too many people to contend with. Apparently over 15,000 people came out to watch the cheese chasing last year and about 20 of them were injured. Those are just the spectators. Sprains and bruises and the odd broken bone seem to be the injury of choice among participants. Now in case you didn't know, participants don't actually have to catch the cheese. They just have to be the first one across the finish line after the cheese, once they've rolled and tumbled down the grassy knoll after the runaway cheese. The cheese, by the way, travels speeds of up to 70 miles an hour so you don't want to be in it's path. After the races everybody retreats to the pub for a pint. Now that's a gouda idea! Here's a bit of video from one of last year's races. Organizers are hoping there'll be a 2011 event but for this year, someone cut the cheese. Wow, that's a real abomination. They wouldn't really deprive thousands of people the chance to get properly hurt, would they? Ziva: Imagine stannding on the side of the hill watching this craziness and getting clipped by a runaway contestant...or worse yet, hit in the head by a 75mph rock hard cheese. Yikes! Ha! I thought it was a role of masking tape when I first saw the pic. I thought Home Depot was hosting its Running with the Tape event. Quirks: Nope, it's a 7 pound Double Gloucester Cheese. That's a lot of cheese. All in all it's a pretty cheesy event! I guess too many people wanted some whine with their cheese. Kelly: Good one! I think too many people were havarti-ng a wild time. You are a Meunster to encourage all these puns. How can they cancel it? I already have my tickets! that's one heck of a hill! Lo: Ooh, great one. You crack-er-ed me up. LTHFQ: They sell tickets? That's Kraft-y. Don: Yeah I think I saw you in the video, just brie-zing down the hill. AmyLK: IF you slid down it, it'd probably be pretty bumpy, certainly not velveeta-y smooth. thinkinfyou: Turns out Canada held it's 2nd annual cheese rolling contest last August in Whistler, BC. 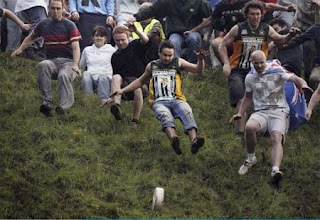 Ha - the Olympics of cheese rolling.